At 23 months, my son's extremely hyper, so it's always a struggle to put his nappies on. We've tried many brands. Some are really good but were expensive; and the cheap ones are often low quality. I hated the plastic ones and those that go lumpy when wet. When it comes to diaper suggestions, I always advice to try a few first because it's "hiyangan". We use cloth diapers most of the time since we're often at home, but we still need disposables especially when we're out and about. Finding the perfect diaper for our babies' needs can be frustrating. It also a painful process, sometimes, because the wrong ones can lead to our babies' discomfort like skin irritation, leakages and even health concerns. My mom came up to the room one afternoon with a pink bag. It was a rather unexpected fluff mail! We used it immediately and I took pictures, but recently my son made my phone fly and now I can't unlock it to access the gallery. Sigh! I so loved the pants-type that they have. Kilig moment when I got this one. Even the bag is so cute! Baby's skin has only about half the thickness of an adult's and is very delicate. It's for this reason that the diaper we choose should provide extra care and comfort. And here's a good news! 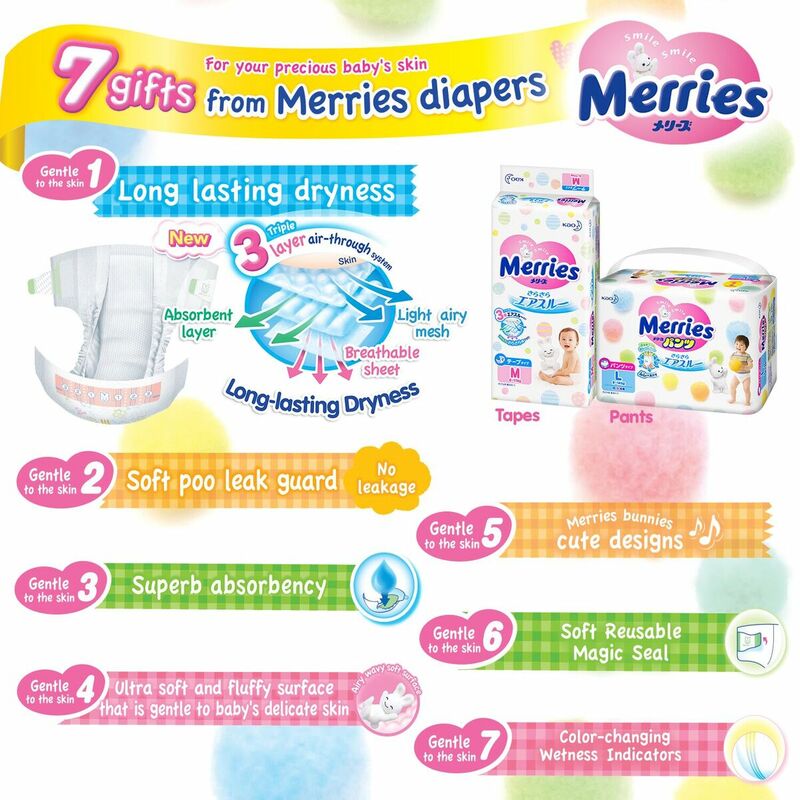 Merries Diapers, Japan's #1 baby diaper brand for 10 consecutive years, are now available in the Philippines. They also have the pants, which we tried immediately. Absorbency is great and fits my son really well. 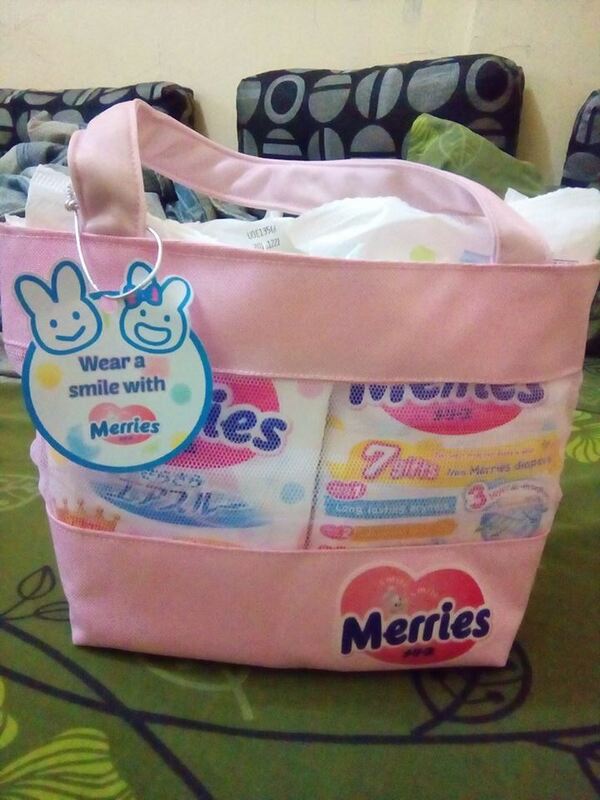 I noticed the sizes seem different from other brands as medium fits Popy with Merries, while in other brands, he uses large. Merries Diaper is gentle to the baby's sensitive skin because of its soft material and quickly absorbs urine before skin gets wet, which helps in preventing rashes and leakage. It has a triple-layer air-through system for the tape type and an airy waist channel for the pants type that releases the heat and moisture inside the diaper. Merries keeps babies' skin dry and comfortable during play and while they sleep. 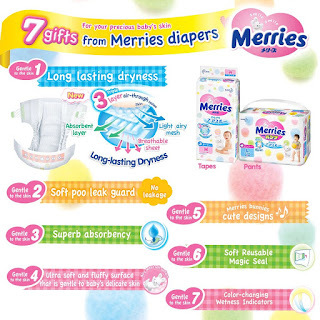 Merries Diapers have to types: Tape-type for newborns to toddlers up to 14kg, and the Pants-type for toddlers and kids from 6 to 22kg. They have an ongoing promo until November 8, 2017 where you'll get a free small tape pack for every 10 packs of Merries Diaper at any participating store. You may check out Merries Philippines website and social media pages for more details. 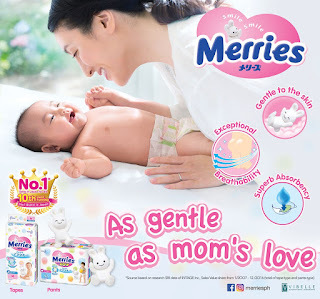 Merries brand is the #1 sales in Japan for 10 consecutive years [#1 by brand in Japan Baby Diaper market in terms of Sales Value share, based on research SRI data of INTAGE Inc., Japan from Jan. 2007 to Dec. 2016. (total tape-type and pants-type)]. Merries Diapers are distributed in the Philippines by Vibelle Distribution, Inc. and are exclusively available in Rustan's Makati, Rockwell, Shangri-La, Ayala Cebu, Seda CDO and in Shopwise Festival Alabang, Sucat, Sta. Rosa Laguna. To get more information and updates about the brand, visit and follow Merries at Facebook and on Instagram and Twitter @merriesph. 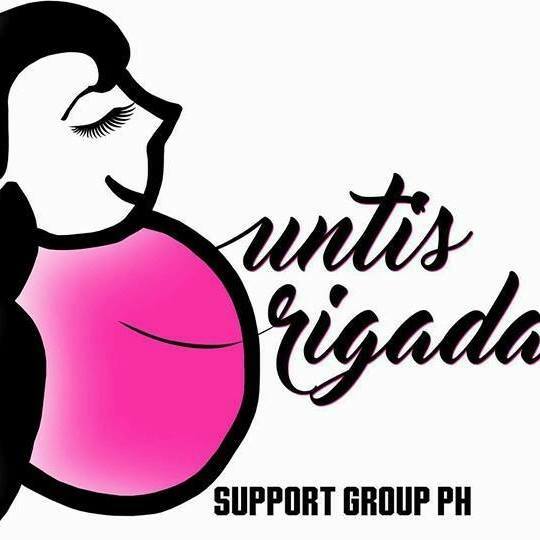 Images courtesy of Merries Philippines, unless otherwise stated.